The DEO tracks Cadmus vehicles moving in the area, forcing Kara and J’onn to go after them. In one of the trucks, they find Jeremiah Danvers and return him home. After losing the use of his hand, he reveals that Cadmus is planning to set off a nuclear bomb using a residue from Kara’s heat vision. With the threat drawing closer, Jeremiah offers to rejoin the DEO to help the search. However, Mon-El has some reservations about Jeremiah, questioning his knowledge of a nuclear bomb. Kara initially rejects his concerns but begins questioning Jeremiah’s motives when Jeremiah begins searching through the electronic files of the agency. Nevertheless, Alex refuses to believe the worst of her father and lashes out at Kara for supposedly defending her new boyfriend. When Kara, Alex, and Mon-El search for the bomb, Jeremiah then turns on J’onn to steal electronic files of the DEO for Cadmus. Though J’onn puts up a fight, Jeremiah reveals a cybernetic enhancement in his arm that wounds even the Martian Manhunter. He escapes with the information and rejoins with Hank Henshaw and Lillian outside the city. Kara and Alex arrive to stop him, but Henshaw detonates a bomb that destroys a train track, forcing Kara to rescue civilians. Alex corners Jeremiah but finds that she can’t shoot her father, letting him escape with the others. With Jeremiah loose and working for Cadmus, Kara and Alex both retreat to the comfort of Maggie and Mon-El respectively. Unfortunately, Winn informs the rest of the team that Jeremiah has stolen the National Alien Registry, giving them access to innocent alien civilians. Meanwhile, Lillian shows Jeremiah the latest step in their plan: a large spaceship. Jeremiah also hints that Mon-El is not who he says he is. Jeremiah receives a cybernetic implant, making him similar to the Cyborg Superman Hank Henshaw. This could be a reference to Dean Cain’s original role as Superman himself. Kara rescues a train the same way Clark rescued a train in Superman. The Flash "Attack on Central City"
While celebrating Valentine’s Day, Gypsy invades STAR Labs and begins attacking Barry. After the team captures her, she informs them that Grodd had taken control of her while searching for a breacher in Earth-2 and has forced her to bring him and an army of gorillas to Central City. 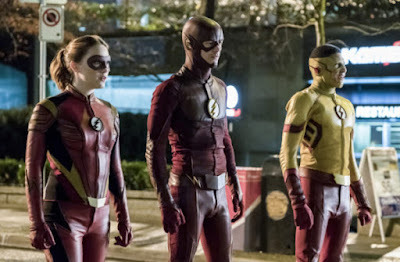 Using Cisco’s powers, the team tries to determine Grodd’s next move in the future, but it only leads to Grodd, taking brief control of Joe, warning Barry of his threat to the city. With Joe as a connector, the group soon discovers Grodd’s plan to use a nuclear weapon to destroy the city. At the last instant, Barry just barely prevents the nuclear launch, but Grodd continues to lead an assault to the city. Meanwhile, Wally and Jesse inform Harry on Jesse’s move to Earth-1, though Harry informs Wally that he may not have much time left to warn him off. Barry, Wally, and Jesse attempt to take on the army on their own, but they are quickly overwhelmed. Fortunately, with Gypsy’s help, Cisco brings Solovar to Earth-1 where he successfully takes down Grodd and regains control of the gorilla army. Though Solovar is determined to kill Grodd, Barry convinces him to let Grodd live in custody in ARGUS as the rest return to Gorilla City in Earth-2. With Grodd contained, Harry takes his own leave to Earth-2, finally giving his blessing to Wally and agreeing to let Jesse live on Earth-1. In celebration of the victory, Gypsy kisses Cisco before returning to her own world, and Barry proposes to Iris at their apartment. Afterwards, as Wally runs through the city, he has a vision of Savitar running past him. HR references “the guy in green in Star City” when hanging up Cupid’s bow, a small reference to the Green Arrow. Gypsy refers to Cisco “Luke Starkilling” her, a reference to Luke Skywalker’s original name in Star Wars. There is a quick cameo by the Accelerated Man in Earth-19. 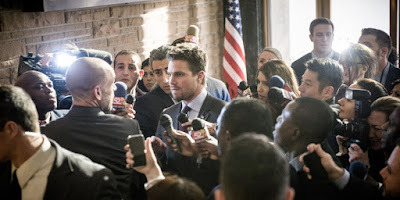 Arrow "Fighting Fire With Fire"
With the upcoming impeachment trial, Oliver relies on Chase to represent him in a hearing with the city council. While witnesses continue to testify against Oliver and Chase, Vigilante attacks the group, ultimately threatening Oliver’s life. Since Oliver is now personally targeted, the team begins a manhunt for Vigilante using part of his visor that Dinah found on the scene. Unknown to any of them, however, Prometheus fights against Vigilante and reveals that Prometheus is actually Chase. In the meantime, Felicity uses Pandora to find a way to persuade a potential councilperson, and Curtis works to enhance his T-spheres for the field while also trying to meet with Paul. Five years ago in Russia, Anatoli invokes a Bratva rule to briefly save himself and Oliver, giving Oliver time to find evidence on Kovar’s deal with Gregor. Under the pressure of resignation, Oliver is convinced by Chase to ultimately denounce the Green Arrow as a murderer to save face with the council. The rest of the team successfully stops Vigilante with the help of the new T-spheres when he begins an attack during a press conference. After the conference, Oliver is cleared from resignation by the council, but Thea resigns her own position fearing diving too deep into politics. Unfortunately, for her use of Pandora, Felicity agrees to join a hacker group known as Helix, and Curtis’s meeting with Paul reveals Paul’s plans for a divorce. Back in Russia, Oliver finds proof of Gregor accepting a bribe from Kovar which turns the Bratva against Gregor. However, Kovar betrays Anatoli and open fires at the group. Back at Star City, Chase confronts a newly-hired Susan with a “life or death exclusive” and kidnaps her. Adrian Chase is revealed to be Prometheus, though his comic-book counterpart was actually Vigilante.